New aquaculture technology aiming to reduce the $6 billion annual losses in yield. Cutting edge farmer-led disease diagnostics technology could help combat devastating disease outbreaks in global fish and shellfish production, saving up to $6 billion lost annually across the global aquaculture industry. 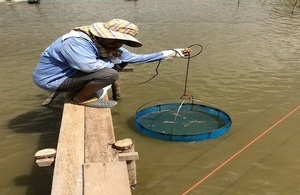 The UK’s Centre for Environment, Fisheries and Aquaculture Science (Cefas), a recognised world leader in aquatic food security, is working with Governments and industry in the UK and Asia to develop new DNA-based diagnostic technology linked to data reporting by smartphone, which can be used by local famers at the “pond side” to rapidly detect potentially devastating diseases, such as White Spot Syndrome Virus (WSSV). Cefas is leading field trials in Thailand, where diseases like WSSV and other emergent problems such ‘Early Mortality Syndrome’ have led to a halving of annual yield and profit (amounting to $2bn) from the shrimp industry. It is hoped that this revolutionary approach will help ensure that early detection enables faster management of infection and disease and more effective control of outbreaks, which in the past have led to serious impact on food supply and a loss of profits for the poorest rural communities engaged in farming. “In countries where veterinary and diagnostic infrastructures are not as developed as the centralised networks established within the EU, farmer-led approaches offer the potential to better manage diseases and to safeguard local profit and a sustainable supply chain”. The results of the field trials in Thailand during 2015 and 2016 will enable Cefas and partners to further develop this new technology, which is hoped to be available to industry from 2017. “Developing new approaches to safeguarding food security will be increasingly important, with the global population projected to increase by 2 billion by 2050 and consumption of seafood in Asia alone projected to increase by 50%.